Your Yonkers cosmetic dentists offers dental veneers on teeth in a variety of options, ranging from press-on veneers to porcelain, resin and prepless veneers. Veneers on teeth can correct many cosmetic issues. Veneers for crooked front teeth make your smile shine again. And small teeth veneers help make small teeth in adults look more normal. In fact, veneers for small teeth are common because they make teeth longer. While dental veneer costs remain relatively high, what’s it worth to you to have a great smile? A beautiful smile makes all the difference when it comes to your self-confidence. Small teeth in adults, gaps in your teeth or tooth discoloration all compromise the look of your smile. Your Yonkers cosmetic dentist, open on Saturday and Sunday, can help you determine if veneers are the right choice for you. Porcelain veneers. The most expensive, but most natural-looking material makes the best veneers for crooked front teeth. They’re custom-made for size and shade, and they’re quite durable. Of course, your dental veneer costs increase for this level of quality. Composite veneers. These veneers are made from the non-metallic material used to fill cavities. Composites usually fix minor chips and gaps or to make teeth longer. They aren’t quite as expensive, but they’re not as durable either. Instant veneers. These are premade and work well as small teeth veneers or for broken teeth. Because they’re premade, the dental veneer costs are lower, but an exact shade match isn’t always possible. Removable veneers. The newest style of veneers on teeth is a hybrid between porcelain and instant. They are custom made, but thinner, so they can be removed if needed. 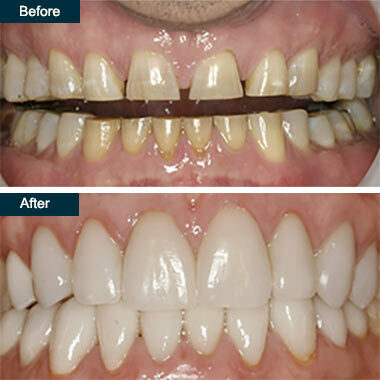 While these veneers are the less expensive, they may not be a suitable long-term solution. The procedure for veneers is relatively quick and usually accomplished in two visits. After discussing your needs and desires regarding your smile, your Sunday dentist in the Yonkers takes X-rays and impressions of your teeth. The dental lab needs between two and four weeks to make your veneers. Temporary veneers may be applied while you’re waiting, especially if your dentist removes a small amount of enamel for placing the veneers. Removing half a millimeter to a millimeter of enamel is far less than would be removed for a dental crown or filling. When your new veneers are ready, you return to the dentist, open on Saturday even, to have your teeth cleaned, polished, and etched for proper bonding of the veneers. Your dentist cements the veneers into place using an ultraviolet light to speed up the bonding process. A follow-up visit may be necessary to check that the bond is secure and your gums are handling the veneers well. Veneers, especially ones made of porcelain, appear realistic. They have the same optical qualities of natural teeth. Porcelain and most composites are stain-resistant and keep their color. Veneers on teeth are relatively durable and can last from seven to 15 years. With a brighter, more even smile, your appearance improves with your confidence. Veneers require no special after care; just brush and floss. Veneers on teeth are artificial and not a natural solution. Dental veneer costs may be prohibitive for some individuals at $1,000 to $2,000 per tooth. Dental veneer costs aren’t usually covered by dental insurance. Though relatively durable, veneers can chip or break. If that happens, you must completely replace them; they can’t be fixed. If you grind your teeth, bite your nails or chew ice, your Yonkers dentist may not recommend veneers. Because veneers require some removal of enamel, getting them is a permanent decision. Some people have experienced an increase in tooth sensitivity because of the enamel loss. Since your teeth can still decay, veneers may not be your best option if you have a history of weak enamel, gum disease or tooth decay. Veneers on teeth can perfect your smile, correct for small teeth in adults, make teeth longer and brighten the color of your teeth. The realistic appearance of veneers makes them a good choice for many people. Your Yonkers dentist, as a general dentist open on Saturday, helps you make the best choice in terms of dental veneer costs and lifestyle desires. Do you have any questions about the Dental Veneers (press on teeth veneers) procedure in Yonkers, Westchester NY? For more information or to schedule an appointment with the cosmetic dentistry of Yonkers please contact our dental clinic for consultation.